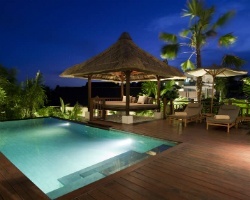 *Karma Kandara* epitomises the Karma Resorts private pool villa resort experience. Internationally renowned as the place to be on Bali's Bukit Peninsula, Karma Kandara's 54 luxury two-, three- and four-bedroom private pool villas are an ideal choice for friends, family and group gatherings. With their high pitched roofs, the open plan living pavilions have an airy, expansive feel and comprise living and dining area and a fully equipped kitchen featuring the latest SMEG appliances. Top of the line amenities are used throughout including LCD TVs and surround sound audio. All bedrooms are oriented to face the ocean and boast large, semi-outdoor bathrooms with stand-alone tubs. Interiors are accented with antique artifacts and the work of local artists. 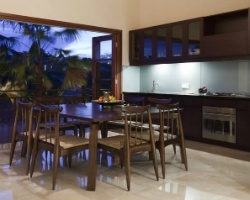 Ideal location for a family vacation or romantic getaway! Buyer May Receive A Title Fee Credit, Inquire For Details! Come explore Bali each year with a rtu in perpetuity! Price is negotiable! Buyer May Receive A Title Fee Credit, Inquire For Details! Beautiful cliff top resort! Maintenance fees paid when used! RTU until 2038! Price is negotiable! Stay at any resort in the Karma network including locations in India, Australia, Isles of Scilly, Indonesia, and Bavarian Alps! Escape to complete paradise! RTU until 2038! Can be used worldwide! Buyer May Receive A Title Fee Credit, Inquire For Details! Reasonable offers will be considered! Explore beautiful Indonesia with 165 annual points! RTU until 2028! Buyer may receive a title fee credit. Ideal suite for a couples getaway! RTU in perpetuity! Buyer May Receive A Title Fee Credit, Inquire For Details! Come stay in paradise! Great for couples or families! Buyer may receive a title fee credit, inquire for details! Pick your vacation dates with 165 annual points! Buyer may receive a title fee credit, inquire for details! Fractional vacation membership! 4 floating weeks per year! RTU until 2028! Inquire for details!